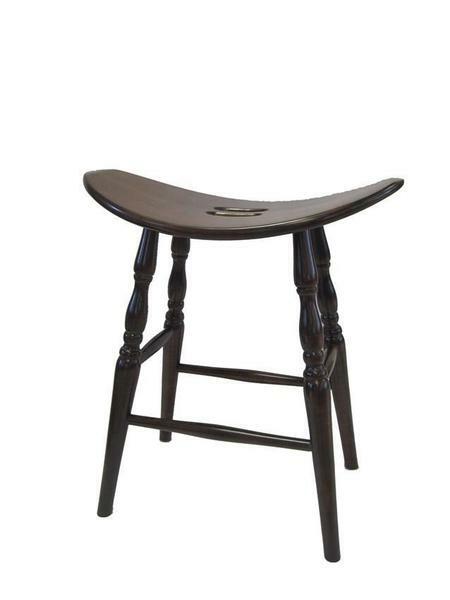 Enhance your cozy country kitchen with a set of Amish Ohio Saddle Barstools. A backless barstool is a great choice when space is limited. The design of these custom made bar stools makes it easy to slide them underneath the counter when they are not in use. These solid wood saddle barstools encourage good posture while sitting. Select a 24" counter height or a 30" bar height to use in your game room and get ready for a great evening! For casual dining at your kitchen island or counter, these Amish bar stools provide an attractive design. Natural and rugged these Amish stools will be right at home in your country furniture collection. These Amish made barstools are built to last. Select the wood and stain you like and choose either the decorative legs that are shown or a smooth plain leg to complement your decor. Take a look at our country style furniture selections for more Amish furniture in this style. Line your kitchen counter with a set of these saddle barstools and create the perfect spot for kids to do homework at the counter. The Ohio Saddle Barstool is a great candidate for a restaurant or pub. Visit our Contract Sales Page to find out information about solid wood bar stools for business. Call us toll-free at 866-272-6773 with any questions or visit our DutchCrafters Furniture Store in Sarasota, Florida to experience our Amish furniture in person. Footprint for 24" Depth: 14 1/2" x Width: 19"
Footprint for 30" Depth: 16 3/8" x Width: 19"